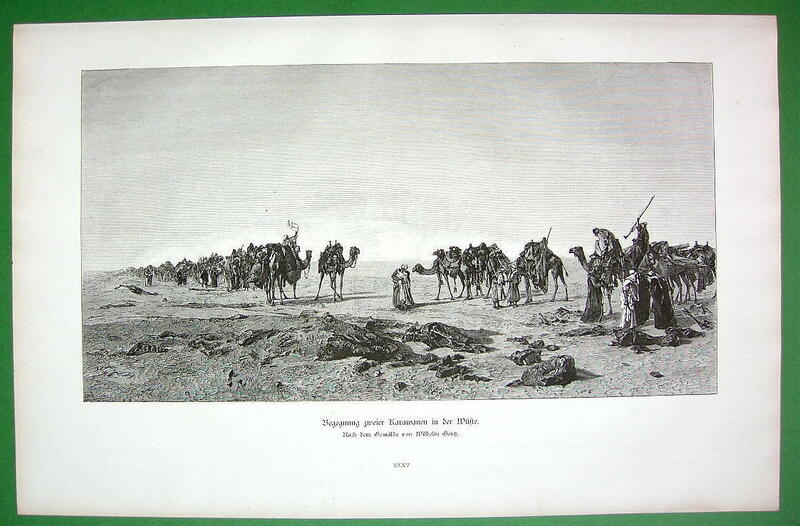 Meeting of Caravans in the Desert Another Quality Print from Martin2001 Type of print: Wood engraving - Original vintage antique print Year of printing: 1888 Artist - Engraver - Publisher: Gentz - n/a - Richard Bong, Hanfstaengl. Condition: Excellent - Very good - Good - Fair. Size of print in inches: 10 1/2 x 14 1/2 (1 inch = 2,54 cm) Type of paper: Thick - Heavier - Medium heavy - Thin Reverse side: Blank - With text or pictures Notes: Green border around the print is a contrasting background on which the print was photographed, it is not part of the print. ---------------------------------------------------------------------------------- Martin2001 Satisfaction Guaranteed Policy ! Any print purchased from us may be returned for any reason for a full refund including all postage. Powered by Turbo Lister The free listing tool. List your items fast and easy and manage your active items.